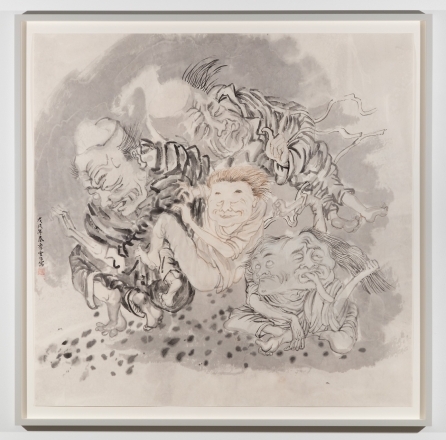 Please join us for a conversation with Yun-Fei Ji, John Yau and Robert Lee on Saturday, June 9th on the occasion of Yun-Fei Ji's exhibition, Rumors, Ridicules and Retributions, currently on view at James Cohan’s 291 Grand Street location. 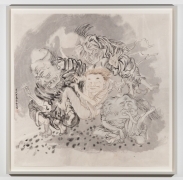 James Cohan will present Rumors, Ridicules, and Retributions an exhibition of new work by Yun-Fei Ji at the gallery’s Lower East Side location from Saturday, April 28 through Sunday, June 17. 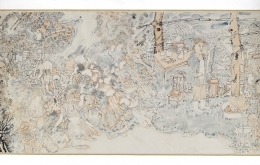 This is Ji’s fourth solo exhibition at James Cohan. The gallery will host an opening reception on Saturday, April 28 from 6-8 PM. In this body of work, Yun-Fei Ji turns his attention to the stories of people living in rural China. The realities of life outside the nation’s largest cities have largely been ignored by narratives of rapid urban growth. Rural lives are often governed by the whims of the powerful, robbing them of physical and spiritual rootedness. Ji is interested in the ways in which people enact their agency both individually and collectively in the face of these larger societal forces, often through subtle but willful acts of resistance. 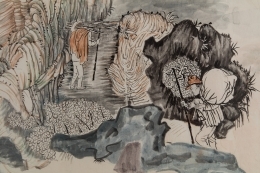 Indebted to the long history of folktales in China, Ji is inspired by the tall tales and ghost stories that he has gathered in the Chinese countryside. Full of ghosts, demons, and other eccentric characters, these stories have frequently functioned as metaphors for power structures and defiance. They are stand-ins for the political undercurrents and the complex tug-of-war underlying the social reality of rural communities. 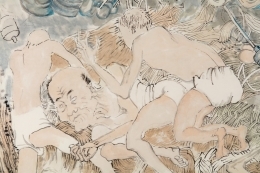 Ji’s own political sympathies have attracted the attention of Chinese authorities, leading government censors to cover portions of his paintings on view during the 10th Shanghai Biennale in 2014. Ji first moved to the United States in the late 1980s. After spending the past six years in Beijing, he currently divides his time between New York and rural Ohio – an experience that has amplified his perceptions of the cultural and ideological disparities in this turbulent political moment. 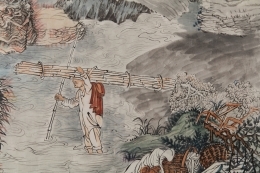 He sees similarities between the migration discourses that he has explored in a Chinese context and the current immigration debates in the United States. In both countries, there is an active “othering” and suspicion of immigrants or migrant workers, fueled by the rhetoric of political leaders. 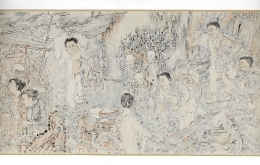 Yun-Fei Ji has employed the stacked perspective and flattened space of classical Chinese painting throughout his career, reinvigorating this traditional style as a means of contemporary storytelling. 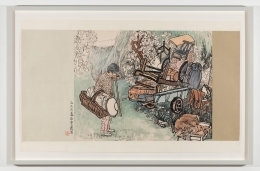 The conscious two-dimensionality of Ji’s compositions imbues his narratives with an immediacy that compels the viewer’s attention. His paintings are acts of resistance in their own way, insisting that these stories of cultural degradation, struggle, and resistance are worth telling. 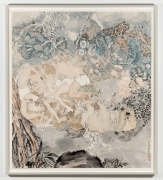 Yun-Fei Ji was born in 1963 in Beijing, China. He earned his BFA from the Central Academy of Fine Arts, Beijing and his MFA from the University of Arkansas at Fayetteville in Arkansas. 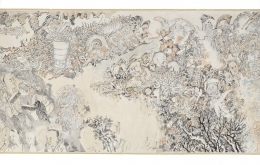 In 2016, the Ruth and Elmer Wellin Museum at Hamilton College presented Yun-Fei Ji: The Intimate Universe, a solo exhibition of the artist’s work which travelled to the Honolulu Museum of Art. In 2012 he was the subject of a solo exhibition at the The Ullens Center for Contemporary Art in Beijing. Other solo exhibitions have taken place at the Contemporary Art Museum, St. Louis, MO; Rose Museum at Brandeis University, Waltham, MA; Peeler Art Center, DePauw University, Greencastle, IN; and the Institute of Contemporary Art, University of Pennsylvania, Philadelphia. 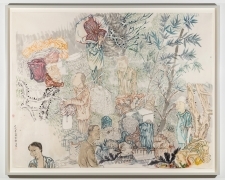 Ji’s work has also been exhibited in major group shows throughout the United States and Europe including Prospect 3 New Orleans in 2014, the 2012 Biennale of Sydney, the 2011 Lyon Biennale, and the 2002 Whitney Biennial. In 2005, Ji was the Artist-in-residence at Yale University, and he received the 2006 American Academy Prix de Rome Fellowship. His work is in major public collections throughout the world including the Museum of Modern Art, New York; Whitney Museum of American Art, New York; and the Brooklyn Museum,. 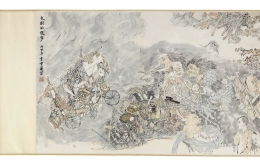 Yun-Fei Ji currently lives and works between New York, NY and Ohio.